I was bound and determined not to let this week's rainy, dreary weather get me down. Packed with flavor, a little heat, and fresh vegetable crunch, these Korean BBQ turkey burgers helped conjure total summer vibes. I love all types of burger patties and I think turkey burgers get a bad rap, often characterized as bland and dry. 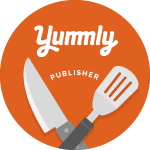 However, I am a fan and have shared a couple recipes over the years like this one for Turkey Burgers with Herbed Yogurt Sauce. It's all about seasoning and bold flavor combinations. 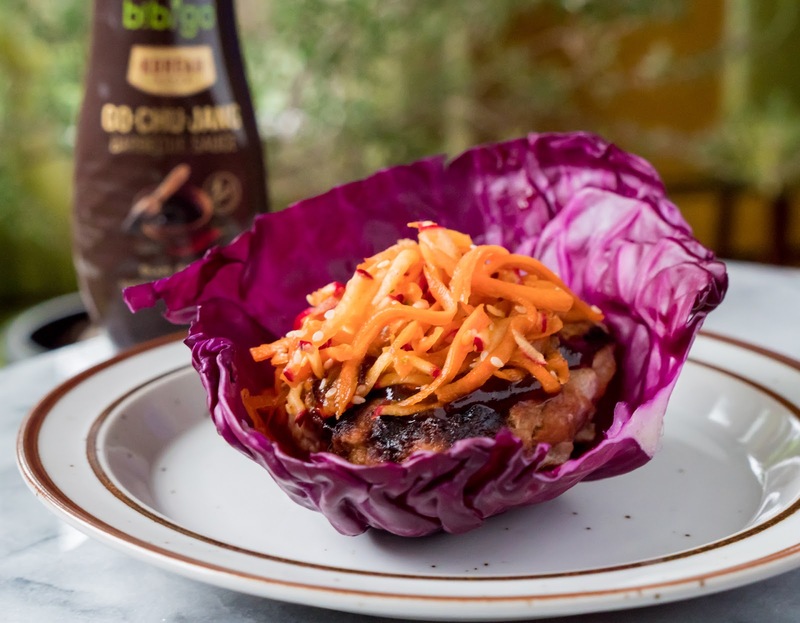 In this combo, the flavor comes first from Bibigo Gojuchang Barbecue Sauce, a fun, new product discovery in this month's Degustabox; and second, from a tangy carrot and radish slaw. If you are not familiar with it, gochujang is a paste found in Korean cooking made from red chili, rice, fermented soybeans, and salt. It lends a sweet heat to dishes. This Bibigo sauce essentially combines that fermented sweet heat with everything you would expect in a traditional barbecue sauce. Think of it as east-meets-west. To match this sweet and savory sauce combination, I created a vegetable slaw that further played on the sweet, spicy, salty, and sour flavors. To keep things on the healthier, lighter side, and to add even more crunch, I used red cabbage leaves as the delivery vehicle instead of a bun. This is a simple, flavor-packed summer meal; and next time we'll enjoy it when it actually feels like summer outside. In a large bowl combine the ground turkey, minced onion, and barbecue sauce. Form four equally sized burgers and place on a lined plate. Refrigerate until ready to grill. In a small bowl whisk together the sesame oil, tamari, rice wine vinegar, honey, crushed red pepper, and sesame seeds. Set aside. Heat grill or grill pan to medium-high and cook burgers until they reach an internal temperature of 165˚ Fahrenheit. Flip once during grilling. While the burgers cook, in a medium-sized bowl add the grated radishes and carrots. Pour on dressing and stir to combine. 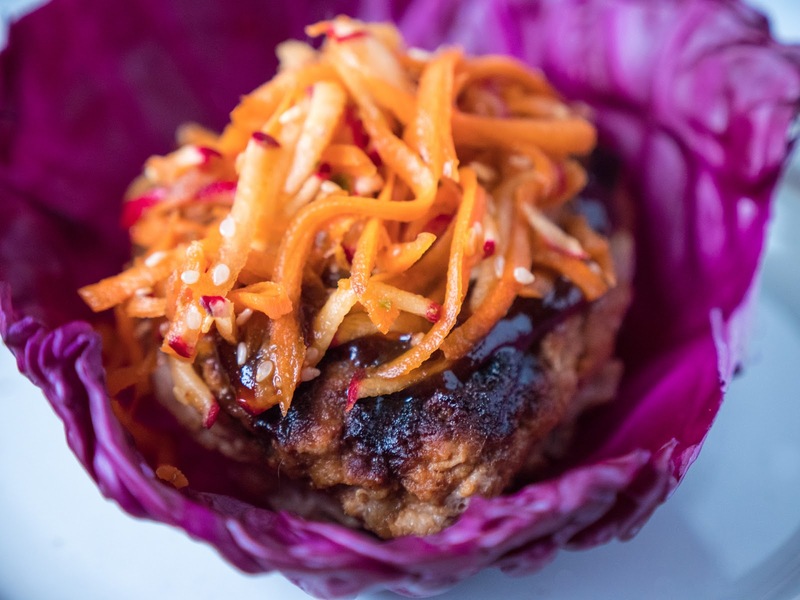 Place each burger on a cabbage leaf and top with some of the radish and carrot slaw. Serve with the extra salad on the side as well as more barbecue sauce for topping if desired. Yay for gluten free! At least it looks it! The tamari I use is gluten-free but I think the barbecue sauce has wheat in it. However, I'm sure you can find a gluten-free barbecue sauce that would work just as well.